Some Leeds United fans are calling for a club legend to be honoured, just days after he turned 75. Howard Wilkinson, United manager for eight years between 1988 and 1996, celebrated his birthday last Tuesday, reaching the three-quarter century mark to become one of the grand old men of English football. Although his Elland Road days are now more than 20 years behind him, Sergeant Wilko still enjoys legendary status among United fans, and rightly so. Leeds United was at a very low ebb indeed when they appointed Wilkinson – their fortunes had plummeted during the 80s, and it’s fair to say that there appeared to be very little light at the end of what had become a long, dark tunnel. 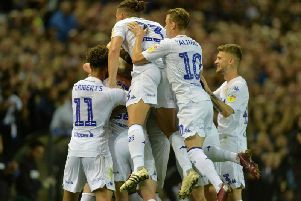 Much nearer the bottom of Division 2 than the top, Leeds were trying to look up, but casting fearful glances behind them at the as yet unknown experience of third tier football. Something had to be done, and the decision was taken to break with the practice of hiring managers from the pool of old boys remaining of Don Revie‘s Super Leeds squad. Allan Clarke of that elite group had been given a go, but Leeds had gone down. Eddie Gray had produced a vibrant young team, but his time ran out. And Billy Bremner reached an FA Cup semi final as well as a play-off final in 1987, but a slow start the following season cost him his job. In truth, it was unfair to blame these Elland Road alumni; the whole approach of the club had for too long been flawed and misconceived, with false economies and disastrous short-termism to the fore, something that Wilkinson perceived and addressed as early as the interview stage for the Leeds job. Indeed, Wilko famously turned the tables at that interview, creating a scenario where he was interviewing the United board, setting out the path to recovery and success over three options of short, medium and long terms. Wilkinson laid it on the line that significant investment would be necessary, to bring about an overhaul of the squad, and of the club’s infrastructure more generally. The board was duly impressed, Wilko got the job, and the rest is history. We all know the story of the Wilko revolution, especially that thrill ride between 1989 and 1992, when Leeds emerged from exile to establish themselves back in the top flight and win the last ever Football League Title. The driving force behind it all was Wilko; without him our history would have been very different – and probably not in a good way. For this, we honour him as a true great in Leeds United history. As we know, he remains the last Englishman, and more importantly, the last Yorkshireman, to win the title of English Champions. The proposal of at least one fan, David Barstow, in a tweet wishing the great man a happy birthday, was that the East Stand should now be renamed the Howard Wilkinson Stand. It’s an idea that has plenty of merit, particularly as it was Wilko’s success that made it possible to conceive and then build such a huge statement of a structure, something that utterly transformed the Elland Road stadium. The club undoubtedly owes Howard a great debt; he provided success at a time when competition was fierce, and titles were not merely bought by the wealthiest. It was an achievement to rank alongside the successes of the Revie team, and it merits this most fitting tribute from the club – particularly as Howard has just reached such a significant personal landmark. And there’s surely no better way to say a slightly belated, but very sincere, “Happy Birthday” to our second greatest manager.